The Boston Red Sox are having a historic 2018 season, due in part to the success of their rookie manager Alex Cora. However, on a team with J.D. Martinez, Chris Sale, and Mookie Betts, how much can credit can one give the manager? Sure, Cora came through the gates of Spring Training this past March and seemed to possess a different type of energy than John Farrell brought to the table each year. Sure, guys like Betts, Martinez, Andrew Benintendi, and Sale are on pace to have career years. Above all, there haven’t been any noticeable issues within the clubhouse this season. All of the aforementioned details are good reasons to credit Cora with the success of the Boston Red Sox, but at what point do we take a step back and give credit to the man who hired the rookie manager in the first place? The media and fanbase tear into Dave Dombrowski for taking the Red Sox from the second-best farm system in baseball, all the way down to 26th—as of the 2018 MLB Trade Deadline. However, his critics are nowhere to be found when the President of Baseball Operations makes a move that positively impacts the team on the field. The list of top prospects traded away by Dombrowski includes Yoan Moncada and Michael Kopech in the Sale trade, Manuel Margot in the Craig Kimbrel trade, and Anderson Espinoza in the Drew Pomeranz trade. While the latter seems like a lost trade at the moment, many may forget that Pomeranz won 17 games in 2017 while posting a 3.32 ERA for the American League East Champions. Since Dombrowski took over in the summer of 2015, he has yet to put together a Red Sox team that has fallen short of a division title—excluding his half season the year he took over. While the regular season success has yet to translate to October success, it’s still something worth noting. Enough dwelling in the past though, let’s focus on the 2018 Boston Red Sox, who hold a nine-game lead over the New York Yankees in the AL East. How does that have anything to do with Dombrowski ? Well, every decision he made this year has had a positive impact on the organization. Dombrowski started by firing John Farrell after the Red Sox lost in the American League Division Series in four games to Houston last season. He replaced him with Cora, the man who won a World Series ring with the Astros last season as their bench coach. Thanks in part to Cora’s arrival, there was a new energy and swagger to this year’s ballclub in Spring Training, which has since translated to the regular season. Of course, that tends to be the case when you bring in baseball’s No.1 free agent on the market in Martinez. Dombrowski deserves an award for this deal in it of itself—a five-year deal with a $22 million average annual value for the former Tigers and Diamondbacks slugger who hit 45 home runs in 2017. But while fans got on Dombrowski’s case about not inquiring about players like Zach Britton, Manny Machado, Brian Dozier, Raisel Iglesias, he acquired Steve Pearce, Nathan Eovaldi, and Ian Kinsler—all of whom came in and made an immediate impact on the team. Even though they received a baptism by fire, having to face the Yankees in the biggest series of the season, they weren’t fazed. Although Kinsler went down in the second inning of Game 2 of the four-game series, he made his impact on Game 1, going 3-6 with two RBIs and a couple of beautiful defensive plays. Steve Pearce: .333/.431/.667/1.097 with five home runs and 14 RBI in 20 games. Ian Kinsler: 4-10 with two RBI in three games. Nate Eovaldi: 2-0 with 15 shutout innings, and just seven hits allowed in two starts. Sure, maybe ‘Dealin’ Dave’ has caught lightning in a bottle with these three veteran players; but in case you still question how much credit this man deserves, let’s compare the lineup from the day he took over in 2015, to the final game of this past four-game series with the Yankees. 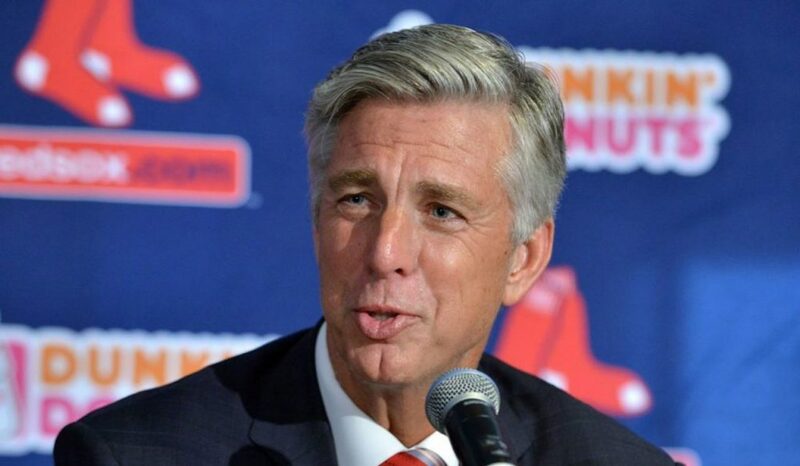 Oh, and since the day the Red Sox hired Dombrowski, they are 290-190 with two division titles, and are on the verge of a third. Sure, credit is due to the manager for the success, as well as the players for performing, but the man upstairs calling all the shots should be getting more credit than he has received in almost three years.